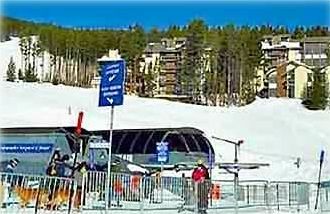 True Ski-in Ski-Out at Ski Watch on Peak 8, Breckenridge! Skiwatch 424 offers TRUE ski-in ski-out on Peak 8. Walk out the door, click into your bindings and schuss down to your choice of SuperChair lifts or the gondola. Ski back for lunch or to change clothes. Enjoy the view of the Continental Divide and the Arapaho National Forest while relaxing in front of your own gas fireplace. And we're REMODELING! New flooring, paint, dining room table, flat panel televisions, the works. We'll post photos presently. Skiwatch offers underground garage parking, a newly refurbished interior and exterior, including a new and bigger deck off the living room, an elevator steps from your door, a sauna, a laundry room, exclusive ground floor ski storage, lounge areas, plus hot tubs overlooking the ski slopes! If skiing and riding is not enough, enjoy cross country skiing, snowshoeing, or a sleigh ride dinner at the Breckenridge Nordic Center just down the road. Breckenridge is only an eye-catching gondola ride away, and offers hockey, ice skating, a state of the craft recreation center, shopping, restaurants, and the right night life to cap a perfect day on the slopes at the perfect ski location - Ski Watch! This is the best ski location in Breckenridge! Two phones with voice mail, wireless internet, flat screen television with a PlayStation 2, TEAC ipod docking station with flat panel speakers that supports CD, MP3, and video playback, hot tubs and sauna, ski storage on the slope entrance, interior halls and stairs, laundry room in building, gas BBQ, garage parking for 2 vehicles, lounge areas, central fire alarms and sprinklers. All of this with TRUE ski-in ski-out too! Ski Watch is ON the Claimjumper Run. Walk out the door, step into your skis and you're off. At day's end, you can ski to the hot tub. The nordic center is just down the road. Nearby you can enjoy a snowmobile tour, a sleigh ride dinner, ice skating, or dog sledding. The Town Recreation center offers swimming, tennis, climbing walls, spin classes, and more.